The Scranton general strike was a widespread work stoppage in 1877 by workers in Scranton, Pennsylvania, which took place as part of the Great Railroad Strike, and was the last in a number of violent outbreaks across Pennsylvania. The strike began on July 23 when railroad workers walked off the job in protest of recent wage cuts, and within three days it grew to include perhaps thousands of workers from a variety of industries. Many had returned to work when violence erupted on August 1 after a mob attacked the town's mayor, and then clashed with local militia, leaving four dead and many more wounded. State and federal troops were called to the town, and imposed martial law. Minor acts of violence continued until the last of the strikers returned to work on October 17, having won no concessions. More than a score of those involved in the shooting were arrested for murder, and later tried and found not-guilty of the crime of manslaughter. Two were tried and one convicted in libel suits related to published criticism of the militia. The militia would go on to be reformed into a battalion of the Pennsylvania National Guard. Opinions differ on the root causes of the strike and ensuing violence. The resulting public dissatisfaction erupted July 14, 1877 in Martinsburg, West Virginia, and spread to Maryland, New York, Illinois, Missouri and Pennsylvania. Violence broke out in Pittsburgh, and between July 21 and 22, 40 were killed and more than a 1,000 rail cars and 100 engines were destroyed. Another 16 were killed in an uprising in Shamokin, Pennsylvania, and strikers set fire to much of central Philadelphia in disturbances there. In 1874 mine owners reduced workers' wages by ten percent. Efforts to rouse a strike in response were fruitless. :316 The next two years saw the mines run on two-thirds time, and another wage reduction of fifteen percent was made in 1876. Again, efforts to organize a strike were ineffective. By the summer of 1877 tensions were high as news spread of the violence in industrial centers across Pennsylvania and the nation. Making matters worse, the local mining companies had again reduced wages, and railroad and industry owners imposed similar cuts for rail and manufacturing workers. As one observer stated "the great trouble here in Scranton is our population, an excess of miners for the work to be done." On July 23, the workers of the Delaware, Lackawanna and Western Railroad in Scranton proposed that their wages be restored to that prior to the recently imposed 10% reduction. On July 24 at 12:00 P.M., 1,000 employees of the Lackawanna Iron and Coal Company, unaffiliated with the railroad, peacefully walked out due to their own wage reduction. The railroad workers struck at 6:00 P.M. that same day. The railroad strike carried implications for the remainder of local industry, as large amounts of goods could not be transported in or out of the city without the use of rail. As one man said, "If the coal trains shall cease to carry the coal to market, the mining of coal must cease." The strikers allowed some passenger trains to reach their destinations. They did not, however, allow mail to enter the city. The strikers met that night at Father Matthew Hall, and agreed to "Be in favor of maintaining the peace and quiet of the city in every emergency." On July 25 The New York Times reported that a general strike had taken place in Scranton. A committee representing the miners called a meeting with W. R. Storrs, coal superintendent. They demanded higher wages, and vowed not to return to work, even if the railroad workers abandoned their strike. :201 The brakemen, firemen and others joined, and every industry in the city was halted with the exception of the Pennsylvania Coal Company. On the morning of July 26, Mayor McKune proposed organizing a group of armed special police to help maintain order in the city. At the time the local militia were stationed across the state in response to railway strike-related struggles occurring in Altoona, Harrisburg, and Pittsburgh. The police group was later renamed as the "Scranton Citizens' Corps," and included 116 members. Mayor McKune met on July 27 with representatives of the Brotherhood of Trainmen. Following a meeting of the railway strikers, the firemen and brakemen agreed to return to work at their previous wages. Shortly thereafter, the mill workers returned to work, with assurances from W. W. Scranton. :12 The miners, however, denounced the concession and resolved to continue the strike. The Citizens' Corps assembled in the Forest & Stream Sportsman's Club and elected officers, including Ezra H. Ripple as their captain. :10 Ripple obtained the approval of General Osbourne, the commander of the Pennsylvania National Guard, to procure arms for the company. Within three days, they acquired 350 guns as well as ammunition. On July 30, due to the efforts of Mayor McKune, who assured the strikers that railway traffic would resume even if it meant enforcement by troops, the strikers from the Delaware, Lackawanna & Western Railroad returned to work at their old wages. Telegrams were sent to New York City and Binghamton stating, "all was going to be right again". Attack upon Mayor McKune. Father Dunn is seen on the left attempting to restrain members of the mob. In response, W. W. Scranton (along with First Sergeant Bartholomew, as Captain Ripple was out of town) led an assembly of his own employees and the Citizens' Corps. :15–7:501 The Mayor confronted the crowd and urged them to halt, but was struck by a man, knocked down, and badly injured. Cries went up from the crowd, "The Mayor is killed! ":207 He escaped however, aided by Father Dunn, who was carried away by the throng. An order was given to fire, though it's doubtful it was heard, and three volleys were released into the crowd. which was quickly dispersed, leaving four dead or dying.Note 3 Estimates of the wounded vary from 16 to 54.:304 Father Dunn returned to comfort the mortally wounded. He also wired the Governor, who informed that the National Guard brigade from Philadelphia, which had been on the way home from quelling riots in Pittsburgh, had been diverted and were en route to Scranton. Each man was subsequently released August 10 on $3,000 bail. :138 The charge of murder was later amended to manslaughter by the grand jury indictment. The trial was convened November 26 under Judge Harding, with the widow of Patrick Langan, one of those slain on August 1, named as prosecutor. Of the 20 subpoenaed by the prosecution to bear witness to the peaceful nature of the protest, only six appeared to testify. Three admitted to seeing violence committed by the mob prior to the shooting. :510 Many more testified on behalf of the accused. That day the jury returned verdicts of not guilty on all charges. :154 Some of the prominent strikers were also arrested, but none was sentenced to punishment. W. W. Scranton filed libel suits in 1879 against Aaron Augustus Chase, editor of the Scranton Daily Times (now the Times-Tribune), and state Judge William Stanton. The suits were related to "inflammatory articles" published in August 1878 in the Scranton Times and Labor Advocate, charging W. W. Scranton with the "crime of murder" during the 1877 strike.Note 9 These articles were published during a period of intense lobbying in Pennsylvania to organize an independent Lackawanna County and designate the city of Scranton as its county seat. (The new county was chartered by October 1878.) Stanton had been sitting judge in 1877 and was arrested for libel in the Scranton case after being implicated by witnesses; he was alleged to have written an "incendiary" piece in the Advocate, "calculated to incite the killing of Mr. Scranton". Two separate trials were held: in September 1879 Chase was found guilty and sentenced to a $200 fine and 30 days imprisonment. Stanton was acquitted in his own trial that month. He had been forced to resign from the judgeship in February 1879. A riot occurred here on August 1, 1877, in which armed citizens fired upon strikers, killing four. Many were injured, including Scranton's mayor. As in numerous US cities, this labor unrest was a result of the US depression of 1873 and a nationwide railroad strike in 1877. Opinions differ on the root cause of the strike and ensuing violence, and what persons or groups should shoulder the blame. They go on to suggest that some unknown number of those participating in the ensuing riot may have traveled to Scranton expressly for that purpose, and not in support of the strikers or their objectives. Historian Michael A. Bellesiles suggested that violence became a type of corporate tool rather than a civic last resort: "management consistently refused to negotiate in any way with their workers and relied entirely on military force to settle the contest." He notes a letter in which W.W. Scranton wrote to a friend, "I trust when the troops come,--if they ever get here,--that we may have a conflict, in which the mob shall be completely worsted. In no other way will the thing end with any security for property in the future." Stepenoff writes of organized labor's "triumph" in the 1878 Scranton mayoral election, and the efforts of then Mayor Terrence Powderly, national leader of the Knights of Labor, to reorganize the police force, "that had disgraced itself in 1877 during a strike of anthracite miners in the Scranton area." In contrast, Logan, who was present as events unfolded, dedicates his book on the topic to the "patriotic young men, who had wisdom to discern the city's danger, and the patient courage to provide for its defense." ^ "In the Scranton area on 8 August 'the engineer on the bloomsburg train saw, when about 2 miles form the city, what he supposed to be a woman lying across the track. He stopped and just as ne did so a bullet went whistling through his hat, and he found the obstruction was merely a dummy, placed there to stop the train and give the assassin a chance for the deadly shot.'" ^ It is difficult to know what newspaper the New York Times was referring to as Labor Advocate. According to the Library of Congress, in that year The Chemung Co. Greenbacker, and Labor Reform Advocate was being published in Elmira, NY. Stanton had been elected as judge in 1877 as a candidate of the Greenbacker-Labor Party. so perhaps this is the correct association. The Greenbacker Party was particularly prominent in the Southern Tier of New York, reaching its peak there in 1878. ^ Bruce, Robert V. (1959). 1877: Year of Violence. Indianapolis: Bobbs-Merrill. pp. 295–298. ^ Kleppner, Paul "The Greenback and Prohibition Parties," in Arthur M. Schlesinger (ed. ), History of U.S. Political Parties: Volume II, 1860–1910, The Gilded Age of Politics. New York: Chelsea House/R.R. Bowker Co., 1973; pg. 1556. ^ Katz, Philip Mark (1998). Appomattox to Montmartre: Americans and the Paris Commune. Harvard University Press. p. 167. ISBN 0-674-32348-3. ^ Laurie, Clayton (July 15, 1997). The role of federal military forces in domestic disorders, 1877-1945. Government Printing Office. ^ Scharf, J. Thomas (1967) [1st. Pub. 1879]. "History of Maryland From the Earliest Period to the Present Day". 3. Hatboro, PA: Tradition Press: 733–42. ^ a b "The Great Strike of 1877: Remembering a Worker Rebellion". UE News. June 2002. Retrieved May 22, 2016. ^ Lloyd, John P. (2009). "The Strike Wave of 1877". The Encyclopedia of Strikes in American History: Routledge. ^ a b Throop, Benjamin (1895). A Half Century in Scranton. Press of the Scranton Republican. ISBN 978-1-293-15356-7. ^ a b Blatz, Perry K. (1999). Keystone of Democracy: A History of Pennsylvania Workers. Pennsylvania Historical and Museum Commission. pp. 96–97. ^ "Distress of the Miners". The New York Times. August 6, 1877. p. 4. ^ a b "A General Strike At Scranton". The New York Times. July 25, 1877. p. 2. ^ a b c d e f g h i j k l m n o p q r s t u Logan, Samuel Crothers (1887). A City's Danger and Defense. Or, Issues and Results of the Strikes of 1877, Containing the Origin and History of the Scranton City Guard. Philadelphia: J.B. Rogers Print. ^ a b c d e f g h i j k l m n McCabe, James Dabney; Martin, Edward Winslow (1877). The History of the Great Riots: The Strikes and Riots on the Various Railroads of the United States and in the Mining Regions Together with a Full History of the Molly Maguires. ^ a b c d e f g h i j k l m n o p Hitchcock, Frederick; Downs, John (1914). History of Scranton and Its People, Volume 1. Lewis historical publishing Company. ^ Foner, Philip Sheldon (1977). The Great Labor Uprising of 1877. New York: Monad. ISBN 978-0-87348-828-0. ^ a b c d Schroeder, Steven Patrick (October 2, 2006). The Elementary School of the Army: The Pennsylvania National Guard, 1877–1917 (Ph.D thesis). Pittsburgh: University of Pittsburgh. pp. 56–57. ^ a b c d Azzarelli, Margo L.; Azzarelli, Marnie (2016). Labor Unrest in Scranton. Arcadia Publishing. ^ a b c d e "Hyde Park History: Excerpts from History of Luzerne, Lackawanna and Wyoming Counties, Pa., W.W. Munsell & Co., New York, 1880. & Jubilee History of Lackawanna County Pennsylvania, by Thomas Murphy, Historical Publishing Company, Topeka-Indianapolis, 1928". thomasgenweb.com. Retrieved September 11, 2015. ^ a b c Bellesiles, Michael A. (2010). 1877: America's Year of Living Violently. New York: New Press. p. 169. ^ a b Aurand, Harold (1991). "Early Mine Workers' Organizations In The Anthracite Region". Pennsylvania History: A Journal of Mid-Atlantic Studies. 58 (4). ^ Federal Writer's Project, Pennsylvania: A Guide to the Keystone State, 1940. ^ a b c "The Scranton Libel Suits, Relics of the Railroad Riots-Scranton's Fight Against his Defamers" (PDF). The New York Times. September 8, 1879. Retrieved May 18, 2016. ^ "The Scranton Libel Suits". The New York Times. September 12, 1879. ^ "Coal Miners' and Laborers' Strike". Historical Marker Project. Retrieved May 16, 2016. ^ Phelan, Craig (2000). Grand Master Workman: Terence Powderly and the Knights of Labor. Praeger. p. 20. ISBN 978-0-313-30948-9. ^ Stepenoff, Bonnie (1999). Their Fathers' Daughters: Silk Mill Workers in Northeastern Pennsylvania, 1880–1960. Susquehanna University Press. pp. 24–5. ISBN 1-57591-028-4. ^ Craft, David (1891). 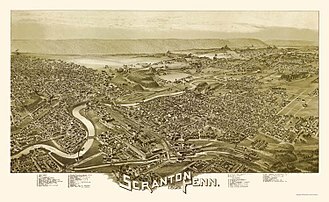 History of Scranton, Penn: With Full Outline of the Natural Advantages, Accounts of the Indian Tribes, Early Settlements, Connecticut's Claim to the Wyoming Valley, the Trenton Decree, Down to the Present Time. H. W. Crew. p. 584. ISBN 978-1-295-63271-8. ^ Hoerder, Dirk (1983). American Labor and Immigration History, 1877–1920s: Recent European Research. University of Illinois Press. p. 72. ISBN 0-252-00963-0. ^ The Chemung Co. Greenbacker, and Labor Reform Advocate : (Elmira, N.Y.) 1878–18?? History of Luzerne, Lackawanna, and Wyoming Counties, Pa: With Illustrations and Biographical Sketches of Some of Their Prominent Men and Pioneers. W.W. Munsell & Company. 1880. pp. 418–21. Wikimedia Commons has media related to Scranton general strike.